To me, the picture accompanying this post speaks volumes about the “Pacific Pivot”. The photo shows LCU 1634 helping the Commonwealth of Northern Mariana Islands (CNMI) recover after being leveled by Super Typhoon Yutu. Well, it looks great until the observer realizes that LCU 1634 is ancient. That venerable LCU in the picture just celebrated it’s 50th year of service on September 6th. Now, don’t get me wrong…that hunk of rust has strong support. 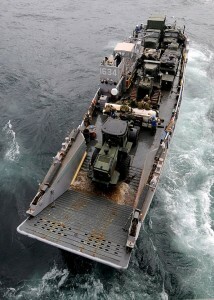 LCU 1634 is attached to a great U.S. Amphibious Warfare asset, the USS Ashland (LSD 48). The whole enterprise is being run by some fabulous folks; Rear Admiral Cooper has done a great job of positioning his assets to provide the most aid they can and Col. Robert Brodie is doing great work. But….those pricy amphibious platforms and strong leaders are limited to doing what they can with the tools they have. And some green eyeshade accountant, backed by a disinterested Navy, an unengaged Congress and a uninformed public decided a fifty-year old landing craft was OK.
A landing craft is a critical functional requirement for any amphibious vessel. If the landing craft is down, the amphibious vessel is largely useless. But America didn’t want to bother investing in a simple replacement (yes, yes, replacements are on the way, but a 50+ year recapitalization cycle is far too long) because landing craft aren’t, oh, sufficiently lethal or something. So if the Marines actually needed to employ the USS Ashland in a military contingency, they’d be relying on a 50 year-old piece of landing tech that is, essentially, held together by welded-on patches of steel and duct tape. And then there is the state of CNMI itself. CNMI is a strategically vital set of islands, and anybody with a passing knowledge of “Pacific Strategy” (such as it is) has known these islands have been under-resourced for years. I won’t bore you with the litany of unfunded resiliency measures America has, in recent years, decided NOT to fund, but…there’s a whole lot of stuff that could have been put into place that would have made CNMI a far tougher nut for a cyclone–even a super cyclone–to crack. One particular piece that hasn’t been funded is inter-island transport; CNMI should have had their own dedicated logistical support fleet by now. I am shocked America still lacks rapid inter-island mobility options out there to move military folks about the islands yet. Wasn’t CNMI once in line to receive a Expeditionary Fast Transport….by 2018? With no island-group/in-CNMI mobility, America has no other option but to raid some poor Pacific Expeditionary Strike Group for a much-needed ship. Today, that is the apparent “Pacific Theatre cyclone-recovery specialist vessel,” the USS Ashland. Frankly, USS Ashland–with her complement of about 400 sailors and more than 400 embarked Marines shouldn’t be at CNMI at all. But, due to a lack of assets and an quintessential American failure to invest in the critical CNMI region, the Ashland has been forced to spend months off CNMI to support hurricane recovery this year. But USS Ashland is needed right now to support a busy 7th Fleet. So what does that mean? Well, for Cyclone Yutu, it means America diverted a front-line asset–again, about 400 sailors and more than 400 Marines–so, as of November 13, her two LCUs from Navy Beach Unit 7 could deliver about, oh, 100 vehicles to the islands? And then serve as a floating FARP for intra-island helicopter traffic? I’m not impressed; an EPF could have done all this far faster with about fifty folks. This all feeds into a bigger story. 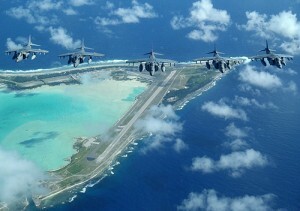 In the Pacific, America has a distressing habit of dismissing strategic territorial holdings. Few are out there in DC or anywhere else making the Pacific a “real” thing for the “average” American. CNMI , for example, is a vital American outpost in the Pacific, but the United States doesn’t seem to want to do much with the islands beyond depositing some folks at some nice bases and…that’s it. Rather than get in there and draw islanders close, we have left the islanders largely on their own, and allowed a corrosive brew of ethnic nationalism to evolve, ready to help tug the islands away from a U.S. orbit. I’d have thought we would have learned the lessons from Vieques, but…nope. We need to do something. When the stodgy old Atlantic Magazine is writing stuff like, oh, “people in CNMI are predominantly Chamorro, Filipino, Chinese, Korean, Carolinian, Bangladeshi, and members of other ethnic groups that are often marginalized in the U.S.“, it shouldn’t take a genius to guess the levers our rivals will, in a few years, employ to pry CNMI from the American orbit. In short, the Pacific Pivot is putting some great people and platforms forward without sufficient regard for aged, feeble or fragile back-end that supports ’em. Put simply, basic pedestrian resources go a long way in facilitating wider strategic goals. So, if the Pacific Pivot is a reality, let’s get about the business of investing in stuff like some simple, old-fashioned organic logistical support at critical places like CNMI. Lethality is great, but we need to make those modest and, yes, boring foundation-level investments. It’s the only way to free up front-line assets to the point where they can focus on their warfighting “job”. Get the new LCUs into production and grow the program of record. Order more EPFs, charter laid-up oilfield support vessels and get about funding the bewildering array of odd-lot basic support craft needed to prosecute a long maritime standoff. And, above all else, let’s stop treating American territories like they are expendable, unwanted bits of populated coral. They are not. We need our island outposts. There’s not a lot of land in the Deep Pacific, and we should make an effort to get along and get ’em into the 21st Century….these little isolated islands pay enormous dividends in enabling America’s small set of pricy and somewhat overtasked “lethality” focused assets. If the Pacific is to become a front line in a modern Cold War-style competition, America will need to make those investments anyway. Why not make ’em now? Before we really need them. 1. Aging landing craft: LCUs are suffering the same fate as AAVs (Marine amtracs). Thirty years ago it was assumed all slow moving amphibious craft would be replaced by now with sea skimming technology from over the horizon (and now over the horizon is considered still too close). So far only a fraction of amphibious connectors have seen this advancement with Navy LCACs (hovercraft). Too many years of delays, program cancellations, ‘analysis paralysis’ and changing budget priorities have left us with LCUs reaching their golden anniversaries. There are amphibious mission critics out there that think the mission can be accomplished with 100% helo lift, but, as they say, “generals think logistics.” While 3/4ths of the armed assault force is delivered by helos and tiltrotors in the first hour, over 2/3rds of the critical ‘tonnage’ is delivered by sea over the next 48-72 hours. There is no alternative, as the air assets must remain committed to maneuvering the assault as it presses inland while also requiring maintenance downtime so it’s ready for the next troop movement. If those helos were to move all the supporting tonnage, they would literally fall out of the sky from wear and tear, and pilots would un-volunteer in droves. (No pilot wants to die for a slinging load of heavy pallets or fuel bladders – they love landing craft.) 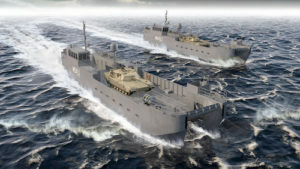 So sea connectors are essential, and I’m convinced the landing craft situation would be better off had we pursued a more conventional 20-25 mph instead of 40-50. Advanced technology and lots of moving parts are ill prepared for high sea states and salt water corrosion. 2. Fleet disruption: While the USS Ashland, 31st MEU, and it’s sailors and Marines were certainly shifted off their cruise schedule and an exercise or two by Typhoon Yutu, I ask this: Would they STILL have been diverted to CNMI had there been plenty of inter-island sealift utility craft? Those Marines didn’t stay aboard in their bunks throughout the relief mission. They literally did the ‘grunt’ work ashore while powered by MREs. I would argue the presence of old LCUs was merely a fractional component of a larger effort by the ship, crew and embarked Marines which would have diverted to CNMI anyway. Whenever a typhoon stalks the Philippines (not even American turf), it’s now common practice for USMC tiltrotors on Okinawa and their refueling C-130s to go on alert for rapid deployment for relief missions. It’s more common in the Pacific than for Atlantic hurricanes hitting the U.S. southeast. 3. Local craft: For an island chain’s population of only 55,000 people, it’s difficult to reach an economic threshold for advanced craft and more of them (and the means to shelter or relocate them from typhoons). Federal subsidizing would help, but CNMI lacks a congress member in DC to trade their vote for the votes of the other 438. Regardless, all routine shipping into CNMI (food, fuel, supplies, etc.) would still need to be doubled in the event of a disaster, as recovery is still very logistically intensive. Only the U.S. military can surge that capability, while making use of it (Pacific presence missions) when not needed for disasters. GUAM (NNS) — The amphibious dock landing ship USS Ashland (LSD 48) departed the waters near Guam and the Commonwealth of the Northern Mariana Islands (CNMI) after assisting Task Force-West with Department of Defense support to the Federal Emergency Management Agency and local authorities, Nov. 20. The Ashland crew, along with 33 other military units, consisting of more than 800 active duty, Reserve, and guard service members from all branches assisted in relief efforts against the aftermath of Super Typhoon Yutu. Ashland arrived in the area Nov. 3. While helping the people of CNMI, the crew had the opportunity to work alongside the Guam Army National Guard and the Guam Air National Guard for the first time. 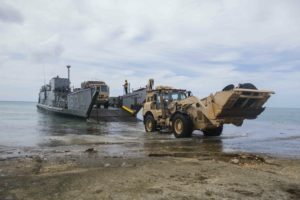 All told, Ashland moved over 100 vehicles and 160 Sailors, Marines and Guam Army National Guard Soldiers that helped clear debris from over 150 miles of road and distributed more than 300,000 gallons of drinkable water. They also assisted with building more than 400 tents for temporary housing in Saipan and Tinian. This was the second time this year that Ashland was called upon to help. In early September Ashland also assisted as a refueling station for helicopters, assigned to the “Island Knights” of Helicopter Sea Combat Squadron (HSC) 25, during defense support efforts for Typhoon Mangkhut which also struck CNMI. Ashland, assigned to Amphibious Squadron 11, is operating in the Indo-Pacific region to enhance interoperability with partners and serve as a ready-response force for any type of contingency. There certainly is a contrast between how China is servicing and building its (not previously inhabited) islands of the South China Sea and US servicing of its Micronesian Pacific islands. – US Navy prioritizing heavy warfighting vessels (including submarines and CVNs) over other vessel classes. – Trump’s US mainland electoral focus and even his lack of personal knowledge of the Western Pacific. He is unlikely to be able to comprehend the Marianas. It is significant that Trump rated another territory, Puerto Rico, as a low post disaster political priority. – whether it is the USN’s job to foster regional development or grimly keep up with the China and North Korea threat?